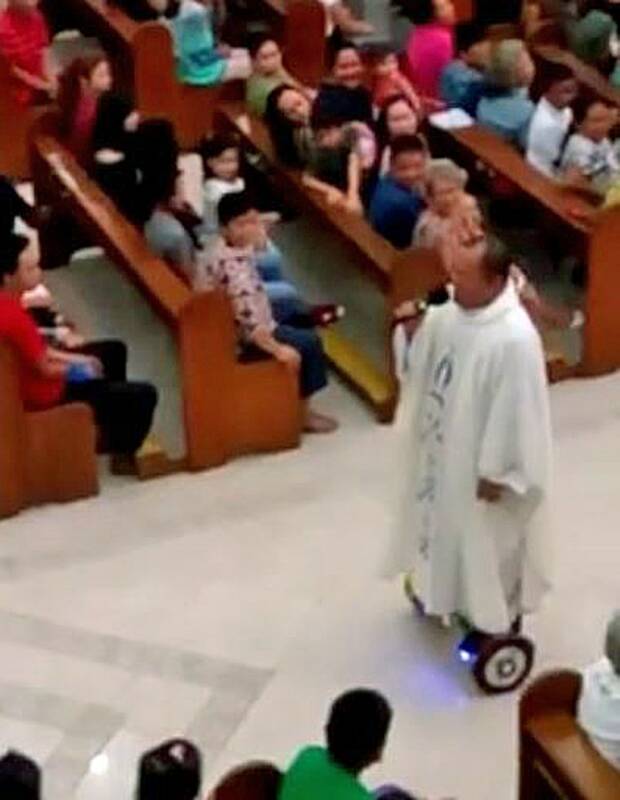 A Catholic priest in the Philippines has been forced to repent after he took a spin on a hoverboard — during Christmas Eve Mass. The unidentified holy roller drew the ire of the Diocese of San Pablo after cell phone video footage of him — riding up and down the nave of his church with a microphone in hand and singing "May the Good Lord Bless and Keep You" — went viral. When he stepped off the device to deliver the final blessing, his parishioners gave him a round of applause. His superiors were less amused. "That was wrong," the diocese flatly declared in a statement posted online. "It is not a personal celebration where one can capriciously introduce something to get the attention of people." The priest has gotten the message — and is apologizing. "The priest said that it was a wake-up call for him," the diocesan statement reads. "He acknowledged that his action was not right and promised that it will not happen again." The motorized man of the cloth has been yanked from his church in metro Manila and "will spend some time to reflect on this past event," the statement concludes. Hoverboards were one of the hottest Christmas gifts this year despite the dangers of falling off the self-balancing, two-wheeled, battery-powered scooters.